Today’s terminology for ornamental iron can be somewhat confusing. What is it? “Rot iron”, “rod iron” or “wrought iron”? The best place to begin is probably with the spelling. It’s actually wrought iron. Wrought means “worked”. Can you picture a blacksmith holding the metal with tongs and hammering it out on an anvil? Those days are gone and so is the metal that blacksmith used all those years ago. 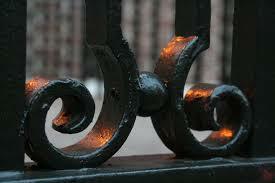 So “wrought iron” not only refers to the process but also refers to the metal. In today’s market, true wrought iron can only be imported from Europe or by finding an old bridge or other antique item. And the process has also changed. Forging became so very labor intensive and costly it was discontinued. The scarcity of the metal is unfortunate because wrought iron is an ideal metal to work. It handles stress well and it’s resistant to corrosion. Today when people talk about wrought iron, it’s more likely they’re referring to metal that is worked. “Wrought” means any metal that is bent, twisted, or hammered into shape as compared to “cast” iron which is poured at a foundry. That vision of the blacksmith still comes to mind. The definition for “wrought” is – to be forged and formed in a plastic state developing an ornamental effect. 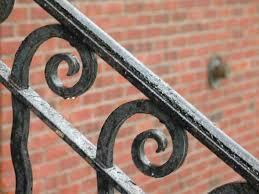 Nearly all “wrought iron” used today is actually made of mild steel. This term has evolved from steel making to a term now largely used to describe the fabrication of decorative pieces. Technically any metal can be wrought but the most common usage and perception is that “wrought” applies to ferrous (iron) metals. Whatever it’s called, wrought iron is still one of the most durable and artistic applications for fencing. If you’re interested in a free quote here in the Las Vegas area for any wrought iron application, please give us a call or fill in the contact form here on our site.